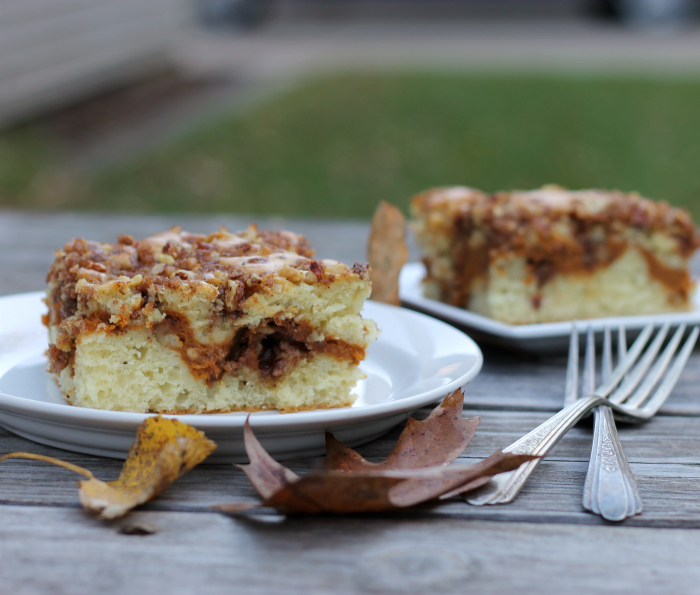 A moist coffee cake with a delicious pumpkin filling and a streusel topping… you will love this streusel topped pumpkin coffee cake. This is the time of year that I start complaining about the weather, but this year I have no complaints. If I didn’t know better I would say that we are still in September. We have been having a wonderful warm spell and I am loving it. I am not sure how long it will stay around, but I will take it for as long as I can. Even with the warmer weather I have been craving pumpkin. I am not sure what it is with me, normally I look for recipes that feature apples this time of year, but for some reason this year I have pumpkin on my brain. 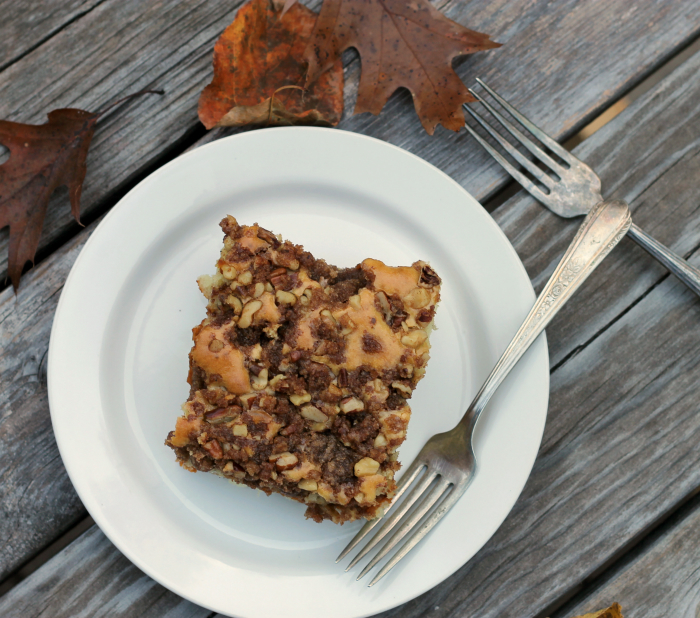 I was looking for a pumpkin coffee cake recipe when I stumbled across a recipe for a coffee cake with a pumpkin filling and streusel topping. I couldn’t resist, really sounded too yummy not to try it. 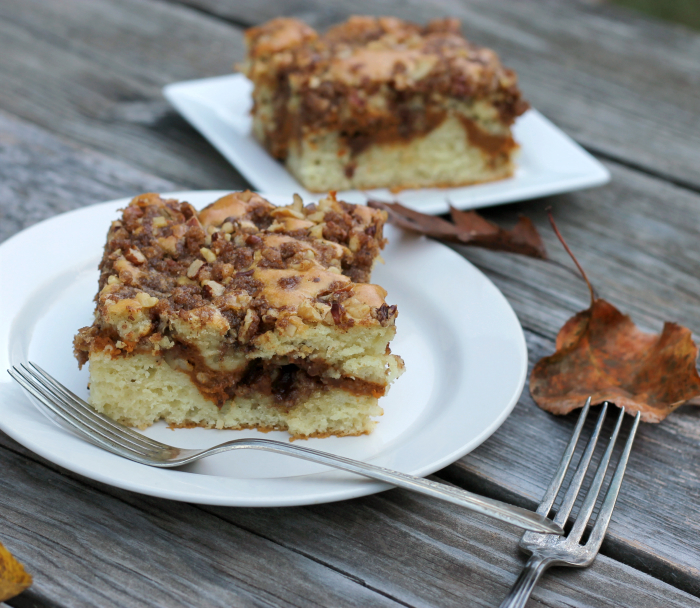 The pumpkin filling makes the coffee cake super moist. Even though the pumpkin is a filling that runs through the center of the cake, the pumpkin flavor is in full force. 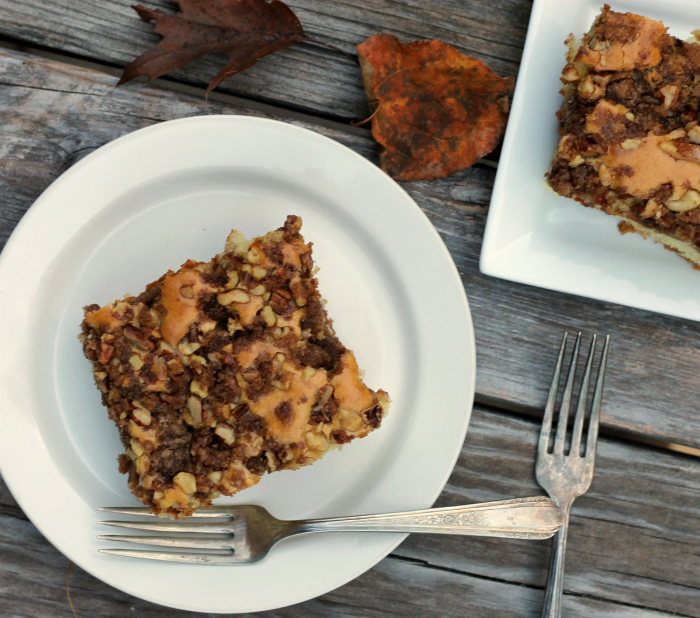 The streusel adds a crunch and to the top, but it sprinkle in with the pumpkin filling. Do you have pumpkin on the brain? You do? I would suggest trying this coffee cake. In a small bowl add the brown sugar, flour, spices and pecans. Add the butter and mix until the butter is worked in and the crumble forms. Set aside. In a medium bowl combine the pumpkin, egg, sugar, salt, and spices, with an electric mixer, process until well blended. Set aside. In a medium bowl add the sugar and oil, beat with an electric mixer until well blended. Add the eggs mix well. Mix in the vanilla. Sift together the dry ingredients, add the dry ingredients to the egg mixture alternately with the sour cream. To the prepared pan, spread half the batter in the bottom of the pan. Sprinkle about half the streusel over the batter. By teaspoon full drop the pumpkin filling over the streusel. Carefully spread the pumpkin filling evenly over the streusel. Drop by teaspoons of batter over the filling. Carefully spread over the filling. Place in the preheated oven and bake for 40 to 50 minutes or until a toothpick comes out clean when inserted. What a marvelous pumpkin treat, Dawn! I love that the pumpkin is a filling vs throughout the whole cake—it’s a nice change of pace—and looks delicious! That sounds like a wonderful recipe. Back to the basic flavor of pumpkin! Hi Dawn, yes I do have pumpkin on the brain, especially after seeing this. Looks amazing!